Surrogates is a science ficiton movie that forms an intriguing companion to I Robot. Now we are the ones who are the robots. In Issac Asimov's robot stories, as in I Robot, a significant issue is the matter of the humanity of the robots. In Surrogates, the issue is our own humanity; but the resolution of the issue in Surrogates is not necessarily the best one in moral terms. A strong point of similarity between Surrogates and I Robot is the presence of actor James Cromwell in each, playing very similar parts as aging and disillusioned scientists. Apart from the movies, Cromwell is an interesting character. Although not maintaining as a high a profile as some political activist actors, he is nevertheless strongly involved in things like animal rights. On more general issues, he seems to be a lunatic fringe leftist. At the 2012 Oscars, he was asked by Fox newsman Jesse Watters about the "Occupy Wall Street" movement. His answer was that "they are the beginning of the revolution." I'm sure Cromwell would be pleased that Glenn Beck was warning about exactly the same thing. Unfortunately, the "revolution," at least in its initial action, seems to have fizzled. We never got a very clear idea about what the "revolution" was going to involve. The Occupiers were so inarticulate and seemed so confused, or were perhaps so secretive or lacking in candor, that the public was never presented with a coherent picture or program of their politics. We know that the movement didn't like Wall Street and didn't like the rich (the "1%"), but exactly what was to be done about this and what sort of economic arrangements the movement would prefer was never clear. At least they heckled Michael Moore when he showed up -- since he is a millionaire. If we may infer, however, a program from the Marxism and Anti-Americanism that modern students learn in school, the background of "OWS" is probably little different from the socialist economics and totalitarian intolerance that are the stuff of modern "education" and that add up to something little different from Soviet era communism. This political dimension to James Cromwell's personal life has some relevance to his role in Surrogates, where he is also the advocate of a revolution that in the end is morally very dubious. 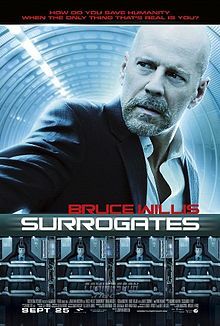 The lead actor in Surrogates is actually Bruce Willis, whose own political commitments seem to be conservative or libertarian, but who maintains a political profile comparably modest or lower than Cromwell's and who seems to have no difficulty working with people in Hollywood of very different political attitudes. What is most noteworthy about Willis, on the other hand, have been his acting choices. Apart from classic action films (Die Hard, 1988; Armageddon, 1998) and light comedy (Blind Date, 1987; The Whole Nine Yards, 2000), Willis has been involved in intriguing if not daring science fiction and drama: Pulp Fiction (1994), 12 Monkeys (1995), The Fifth Element (1997), The Sixth Sense (1999), and Sin City (2005) -- just for the most obvious. This certainly says a lot about Willis's aesthetic and business judgment. The danger for actors who become successful and can choose their roles or even finance their own productions is that they will do a very poor job of it. The rocky career of Eddie Murphy comes to mind, where his talent has been wasted on very poor ventures. Similarly as careful as Bruce Willis about interesting and successful projects has been Will Smith, with everything from I Robot to Men in Black (1997). In Pulp Fiction and The Sixth Sense Willis has been part of a couple of the most notable, remarkable, and memorable movies of all time. This career bespeaks an ability of Willis to get along with many people in the industry, although I have recently heard that Kevin Smith did not enjoy working with him on Cop Out (2010) -- but then there also seem to have been complaints about Smith. The premise of Surrogates is that advances in robots have made possible, not so much autonomous robots, but vehicles for remote sensing, remote action, and, indeed, remote living by human beings. These are the "surrogates." This all would be a boon to anyone suffering from various forms of paralysis, as the prologue of the movie makes clear. We could also imagine it working for the deaf and the blind, although we do not see the kinds of neural connections that would be necessary for that to work. As it happens, people without injuries or disabilities begin to use surrogates because this insulates them from most exposure to accident and injury, to disease, and to crime. Also, one's appearance can be improved, or radically altered. The result, as we are told, is a dramatic decrease in crime and injury. Nevertheless, there are people who reject these innovations; and they are allowed to live, outside ordinary political jurisdiction, in "reservations," where they are led by someone called "the Prophet" -- played by Bruce Willis's old buddy from Pulp Fiction, Ving Rhames. Willis himself is an FBI agent, Tom Greer. Greer lives in the shadow of the auto accident that killed his son and disfigured (mildly) his wife Maggie (Rosamund Pike). Maggie identifies strongly with her surrogate, which barely looks like her and, of course, betrays none of her injuries. The movie begins with a young man, evidently in town for a visit to his father, whom we hear through a car-phone. The young man goes to a club, where he picks up a young woman; and they leave the club to make out in the alley. There they are attacked by an assailant with some kind of weapon. The weapon burns out the electronics of both surrogates. The circumstances of this are unusual enough that the FBI is called in, which means Willis and his partner, Agent Peters (Radha Mitchell). The "young man" surrogate is unregistered. That of the woman is; and Greer and Peters track down the "operator," who turns out to be, not a young woman, but a fat middle-aged man. He's dead. This is supposed to be impossible. Soon, another operator is found dead. This is the young man, away at college, who turns out to be the son of Dr. Lionel Canter, played by Cromwell. Canter developed the surrogates in the first place but later had a falling out with his business partners at VSI or "Virtual Self Industries." He is very wealthy but is now out of the business. He loaned, remotely, one of his surrogates to his son. It was he who evidently was the intended murder victim. Naturally, he is distressed to have indirectly brought about the death of his son, although Greer and Peters do not see how distressed, since they are only interviewing one of his surrogates -- which shuts down. Because of surveillance cameras, the night club assailant is identified and then spotted in real time. The police pursuing him are killed by his weapon, and Greer, observing in a helicopter, crashes in the nearby reservation when the weapon kills the helicopter pilot. Greer, aware of the danger, avoids the worst of the weapon's effects, although he does suffer some physical harm. He is able to pursue the assailant in the reservation, until his surrogate is destroyed by the anti-surrogate mob. Greer is in the hospital for his injuries, but he is astonished to learn that he has been suspended because of his intrusion into the reservation. I suppose he is supposed to have asked the helicopter not to crash there. Nevertheless, Greer leaves the hospital and pursues the case anyway, now using his own physical body, which is disparaged by others as "meat." Meanwhile, the Prophet has himself captured and killed the assailant, confiscating his weapon. To make a long story short, we eventually discover that the Prophet is no more than a surrogate for Lionel Canter himself, who has decided that surrogates are dehumanizing and must be destroyed. He murders agent Peters, in her own home, and takes over her surrogate, which he uses to deceive Greer and uncover the plot against him. This has been directed, of course, by VSI, which developed the deadly anti-surrogate weapon for the military; but we never learn about any individuals at VSI behind the business. Even Greer's inquiries never go further than his boss at the FBI, Andrew Stone (Boris Kodjoe), who has been operating as an agent of VSI. Further inquiries are cut short because Canter decides to wire the weapon into the whole surrogate control grid, so that it will kill everyone in the world operating a surrogate. He thinks that surrogates cannot be eliminated unless everyone using one is killed. Realizing what he is going to do, Greer goes to Canter's mansion, shoots the surrogate bodyguards, and makes his way in to the secret rooms that Canter in corpore uses himself. Having launched his computer program, Canter takes poison and dies. Greer assumes control of Peters's surrogate and is able, with instruction, to disable the deadly effects of the program. However, it will still destroy the surrogate machines themselves, and he hesitates to take the step to disable that part of the program. He decides not to, and every surrogate in the world is consequently destroyed. People begin coming out of their houses, and Greer returns home to discover his wife looking at the items in their son's room. There are conceptual problems with Surrogates. People cannot simply lie immobile in chairs all day while they live their lives through robotic surrogates. You get bed sores. These get infected. Medical Examiner Dr. Jan Garavaglia had a case where a young man had taken to bed out of depression. He was so inactive that he developed an impacted bowel, which turned septic and killed him. So doing nothing but living a life through a surrogate is impossible. Even worse, we see a television ad promoting surrogates for children, which naturally appeals to Maggie Greer, who would have wanted her son to be safe. However, children cannot develop in a healthy or normal way without exercise, let alone ordinary movement. So that is not going to happen. Furthermore, we never see anyone eating a proper meal. We do see Greer in his kitchen, but we never see him really eating there, let alone enough to constitute a proper diet. And although Maggie's surrogate is also seen in the kitchen, presumably to take food into her bedroom, we never really see that happen either. And what kind of life is it when going out on the town does not involve dining? If restaurants are to remain in business, they could only do so by home delivery; yet we never see anything of the sort or have any intimation that people at home would devote any time to formal meals with relatives or company. This all seems unlikely. Thus, the movie does not really show us a well thought out world. Physically, people simply cannot live in the way shown, not without much of the harm and disease that using surrogates is supposed to avoid. That being the case, there cannot be the sharp social line drawn between people who use surrogates and those who do not. Instead, surrogates would be well used for the disabled, for anyone in dangerous professions or practicing extreme sports, and for anyone wanting to try something different. In South Park, one of the parents once was made into a dolphin through plastic surgery. This didn't work out very well. But, with a surrogate, no problem. Dolphin. Lion. Eagle. Incredible Hulk. Victoria's Secret model. One's imagination, or pocketbook, is the limit. At the same time, it is difficult to imagine that any government would allow the "reservations" we see in the movie for people who violently reject surrogates. It is evident in the movie that the people there live in squalor, and this is going to be a public health hazard, even apart from the question of crime. It all looks like one of the "Occupy Wall Street" sites, tolerance for which eventually ran out even in the most "progressive" cities, such as Oakland. It is not difficult to imagine the "Prophet" on a television interview show being asked if he really thinks that quadriplegics are better off in wheelchairs. Does he not want them to walk, or for the blind to see? He is not going to gain any political support, let alone an exraterritorial refuge, with hostile answers. Thus, the dilemma of the movie is forced and illogical. Nevertheless, even if it were plausible, Greer's action at the end is morally questionable. He is a hero for saving everyone from Canter's plan to kill them; but then he does not have the right to decide even for his wife, let alone for most of the population, that the use of surrogates is living life the wrong way -- let alone that he has returned the disabled to their disabilities. Saving his marriage is a poor motivation for destroying the world. And his marriage is not going to be saved very effectively if he ends up in prison because of the magnitude of the amount of property he has destroyed. And we also have to consider the distruption to transportation and all other commerce in the wake of the destruction. Since people do need to eat, they may have difficulty getting any food at all in the circumstances that Greer has created. This does not make for a very satisfying ending to the story. Nor is it satisfying that the murder mystery at the beginning of the movie actually has not been solved. Whether Agent Stone hired and equipped the assailant himself or not, he was not the principal of the conspiracy; yet we never meet even a single officer of VSI who might be considered a suspect in the matter. After all, if Dr. Canter was loaning surrogates to his son, it does not seem likely that at the beginning of the movie he was contemplating killing all surrogate operators. The death of his son provided the despair and the motive for that, while his accidental acquisition of the weapon provided the means. The murder of his son thus pushed him over into being a full fledged villain. But there was already a villain (or villains) at VSI, who planned the assassination and provided the weapon, and we never even meet the man. This sort of thing blunts the conceptual and narrative appeal of Surrogates, which may explain its modest performance with critics and at the box office. The issue of the ultimate villain was also a key point in I Robot. The corporate villain there, Lawrence Robertson, is repeatedly waved around before the audience as the number one suspect, but that turned out to be a red herring. In Surrogates we get no corporate suspect, even though we are given to understand that the ultimate murderer must be there. It is as though the destruction of the surrogates would render all that moot. But it would not. The James Cromwell characters in I Robot and Surrogates, Drs. Lanning and Canter, are both aging scientists and engineers who have become disillusioned with their own creations. However, what this means turns out to be very different. Lanning's solution for the robots is to make them more human, giving "Sony" free will. This makes it possible to fix the danger that Lanning realizes exists in the Three Laws of Robotics. Canter, on the other hand, decides that his creation must simply be destroyed, and all the accompanying people along with it. So he has become a maniac, at least after the murder of his son. He kills himself out of despair and, we might even say, cowardice. Nevertheless, we find Greer has some sympathy for a less murderous, but still self-righteous, version of Canter's goals. Dr. Lanning also, after a fashion, commits suicide, by arranging for his own killing. This is a desperate measure also, but its purpose is to provide the clues that Detective Spooner (Will Smith) will need to figure out what is going on with the robots. His is thus a noble self-sacrifice, unlike the suicide of Dr. Canter. Despite its flaws, Surrogates provides some valuable food for thought, not the least in terms of the possibility of such a system of surrogates coming into being as in the movie. The moral choices of Greer and Canter are poor to awful, which is perhaps of much greater interest than the unproblematic viciousness of our unknown corporate villain. That all three may be in some way unsympathetic, however, and Greer's final judgment flawed, does not provide much for an audience to get behind.